Granuloma faciale (GF) is an uncommon, benign, inflammatory skin disorder of unknown etiology. It is characterized by single or multiple, grey-brown or violaceous nodules or plaques primarily occurring on the face and occasionally at extra-facial sites. The lesions are commonly on areas with sun exposure. Middle aged adults are usually affected. The disease is notoriously resistant to therapies and often tends to relapse when treatment is discontinued. We present a patient with multiple lesions of GF and its response to topical tacrolimus. A 35-year-old female presented to our department with a 5 year history of single, asymptomatic, grey-brown pigmented, nodule over the left cheek [Figure 1]. It started as a pin head sized papule which gradually increased to 2.5 cm × 1.5 cm in size. Two years later similar lesions appeared on the forehead, both arms and upper back. There was no skin ulceration. No photosensitivity, fever or joint pain was present. Past and personal history was unremarkable. General physical and systemic examination was normal. Cutaneous examination revealed multiple, well-defined, grey-brown, indurated, non-tender plaques, varying in size from 0.5 cm × 0.5 cm to 1.5 cm × 2.5 cm, present on the left cheek, left forehead, both arms and upper back. Overlying surface showed prominent follicular openings, telangiectasia and peri-lesional erythema. Co-existent macular amyloidosis was present over upper back [Figure 2]. Routine hematological and biochemical investigations were normal. 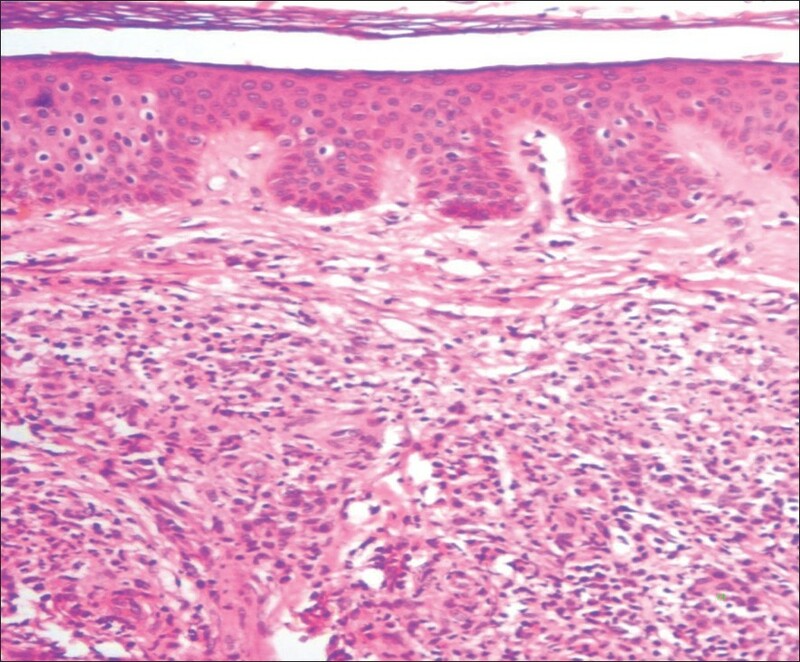 Skin biopsy (4 mm) from plaque revealed normal epidermis with clear sub epidermal 'Grenz zone' and pan dermal dense infiltrate comprising of neutrophils, lymphocytes, histiocytes and plasma cells. Small dermal vessels showed infiltration of neutrophils in the vessel wall along with peri-appendageal and peri-neural infiltrate in subcutaneous fat [Figure 3]. Features were consistent with diagnosis of GF. She was started on intralesional triamcilone acetonide 10 mg/ml injection monthly with Tab. Dapsone 100 mg twice daily for about 1 year with no improvement. These were then stopped and cryotherapy was started. Six sessions of cryotherapy were performed once monthly after which she developed erythema and itching over the plaques and discontinued treatment. Topical tacrolimus 0.1% ointment twice daily was started. The lesions showed 40-50% improvement after 3 months of therapy [Figure 1]. The treatment was well tolerated without any side effects. GF is an uncommon, benign, inflammatory dermatosis usually confined to the face. However, extrafacial lesions have also been reported. The aetiology is unknown. Classically, red-brown or violaceous nodules or plaques with associated telangiectasia and follicular accentuation are seen on the face over sun-exposed sites. The condition is typically asymptomatic and has no systemic features. The course is chronic and patient seek treatment due to cosmetic concerns. In recent years successes with topical calcineurin inhibitors has been reported. Several authors have reported complete or near-complete resolution of lesions after application of topical tacrolimus 0.1% ointment. 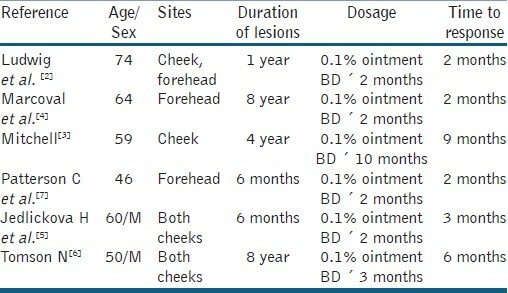 ,,,, Treatment regimens, duration and time to resolution of lesions have varied in these case reports [Table 1]. The shortest time reported for resolution is 2 months after twice daily application. Others have found time to resolution to be between 4 and 6 months. , In our patient, treatment with tacrolimus 0.1% ointment twice daily for 3 months has resulted in improvement. Tacrolimus inhibits T-cell proliferation, production and release of several pro-inflammatory cytokines like interleukin-2 (IL-2), IL-4, tumor necrosis factor-alpha, and interferon-gamma (IFN-gamma). Although the pathogenesis is still unknown, it has been suggested that GF may be an IFN-gamma mediated disease. In addition, an increased production of IL-5, probably induced by the clonal expansion of a locally recruited T-cell population may enhance the attraction of eosinophils into the lesions of GF. Therefore, a possible mechanism of action of topical tacrolimus in this condition may be the inhibition of IFN-gamma and IL-5 production and release, induced by the down-regulation of the T-cell activity, primarily involving the calcineurin binding and inactivation. However, we did observe eosinophils in skin biopsy in our case, probably since the biopsy was taken after one year of oral dapsone. Our patient experienced a relevant improvement within 3 months of treatment with tacrolimus ointment after no response with intra lesional steroids, dapsone and cryo therapy. In conclusion, the previous reports and our observation suggest that topical tacrolimus may be a well-tolerated, efficacious therapy for GF. 1. Ortonne N, Wechsler J, Bagot M, Grosshans E, Cribier B. Granuloma faciale: A clinicopathologic study of 66 patients. J Am Acad Dermatol 2005;53:1002-9. 2. Madan V. Recurrent Granuloma Faciale Successfully Treated with the Carbon Dioxide Laser. J Cutan Aesthet Surg 2011;4:156-7. 3. Ludwig E, Allam JP, Bieber T, Novak N. New treatment modalities for granuloma faciale. Br J Dermatol 2003;149:634-7. 4. Mitchell D. Successful treatment of granuloma faciale with tacrolimus. Dermatol Online J 2004;10:23. 5. Marcoval J, Monero A, Bordas X, Peyri J. Granuloma faciale: Treatment with topical tacrolimus. J Am Acad Dermatol 2006;55:S110-1. 6. Jedlickova H, Feit J, Semradova V. Granuloma faciale successfully treated with topical tacrolimus: A case report. Acta Dermatovenerol Alp Panonica Adriat 2008;17:34-6. 7. Tomson N, Sterling JC, Salvary I. Granuloma faciale treated successfully with topical tacrolimus. Clin Exp Dermatol 2009;34:424-5. 8. Patterson C, Coutts I. Granuloma faciale successfully treated with topical tacrolimus. Australas J Dermatol 2009;50:217-9. 9. Simpson D, Noble S. Tacrolimus ointment: A review of its use in atopic dermatitis and its clinical potential in other inflammatory skin conditions. Drugs 2005;65:827-58. 10. Smoller BR, Bortz J. Immunophenotypic analysis suggests that granuloma faciale is a c-interferon-mediated process. J Cutan Pathol 1993;20:442-6. 11. Gauger A, Ronet C, Schnopp C, Abeck D, Hein R, Köhn FM, et al. High local interleukin 5 production in granuloma faciale (eosinophilicum): Role of clonally expanded skin-specific CD4+ cells. Br J Dermatol 2005;153:454-7.